Why is my water not rendering nor in preview nor in final? I tried a simple water tutorial and followed it step by step, but my water just won't render, not even in the preview. I already checked questions that were similar to mine but nothing worked: I already checked that the water is in fact renderable (the camera icon is activated) and the maximum draw type is set to solid or textured. Here's the file: https://drive.google.com/file/d/0B7-B85l-ySrhOG16RVExUXJ1cEU/view?usp=sharing I started blender just yesterday, I'm really new to this, so any kind of help is really appreciated! "FLUID" object is your actual Fluid Domain and it has 3 material slots assigned to it. First one is pure transparent material and this is why your fluid isn't visible. Remove "TRANS" and empty material and you are good to go. Also, you have "dOMAIN" object which is doing nothing. Consider deleting it or hiding. 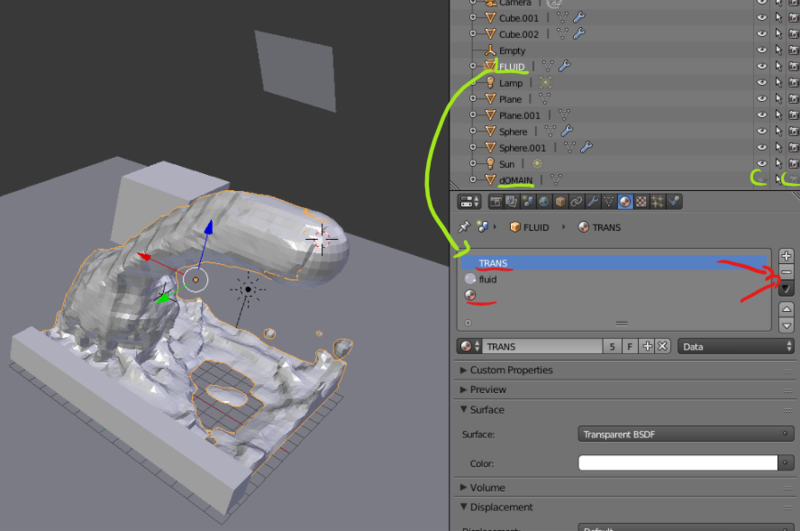 Blender not rendering water in F12 render? Why is the preview render slower than the final render? Why some objects are not rendered in the final rendering?